The 2018 Scottish Islands Peaks Race has officially opened entries for this year’s race, simultaneously launching a fresh new website. This adventure race is for teams of sailors and fell runners (both youth and adult) and is held annually on and around the most beautiful parts of the west coast of Scotland. The race starts in Oban with a short hill run, then a sail to Salen on Mull, run over Ben More, sail to Craighouse on Jura, run the Paps, sail to Arran, run Goat Fell, then sail to Troon. The race takes 3 to 4 days and caters for multihulls, racers, and cruisers. Each team consists of 5, usually 2 runners and 3 sailors. There is also an All Rounders class for sailors that can run or runners that can sail, as well as a class for Youth (with the assistance of a few adults). This year’s race will start at midday on Friday 18 May in Oban, with the first teams expected in to Troon as early as late Saturday night or early Sunday morning. As with previous years, the race will be tracked live on our website for those wanting to follow along from home. The Scottish Islands Peaks Race is an epic sailing and fell running race that has been in operation since 1983. 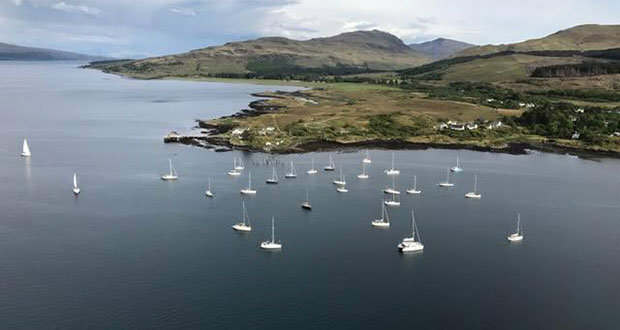 The race starts in Oban and visits the isles of Mull, Jura, and Arran, with a hill running section on each, before the final finish line in Troon. The race takes 3 to 4 days and caters for multihulls, racers, and cruisers. The sailing course of 160 nautical miles includes the strong tides and overfalls of the Corryvreckan and the Mull of Kintyre, whilst the runners cover 60 miles and 11,500 ft of climbing. A long weekend with a difference, and a race you will never forget.